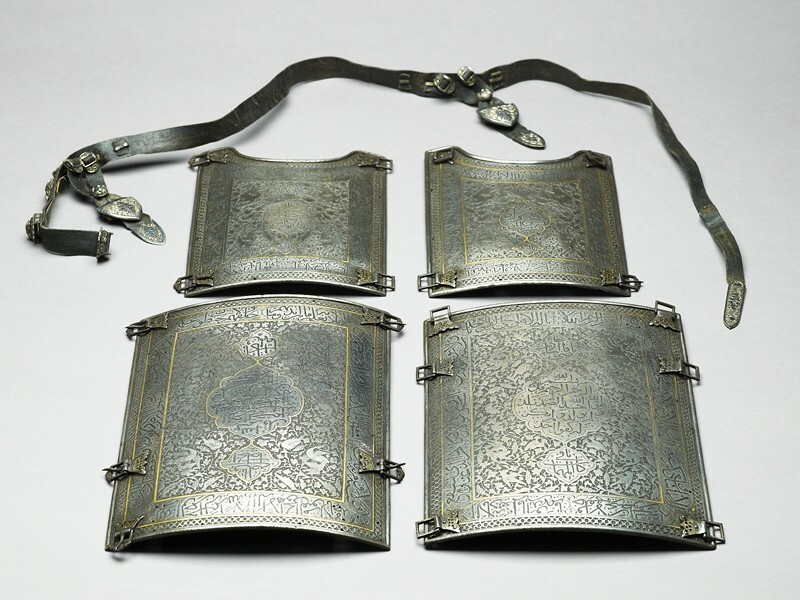 Material evidence of Islamic arms and armour only becomes significant from the 16th century onwards, when cuirasses of metal plates progressively replaced lamellar armour and coats of mail documented in the previous centuries. During the 16th century, chahar a’ineh (literally ‘four mirrors’) cuirasses were introduced in Iran. Placed on top of a mail shirt, these consisted of four curved plates, two with recesses for the arms, which were buckled around the person’s body with leather straps. Full sets of armour only rarely survive, making the one presented here an exceptional find. The central field of each plaque is decorated with medallions inscribed with Qur’anic verses, surrounded by a thick foliage inhabited by birds including hawks attacking herons. Additional Qur’anic passages from the ayat al-kursi or ‘throne verse’ (Qur’an, 2:255) frame the central field in a continuous frieze that still carries traces of the original gold inlay. The armour is signed by Luft ‘Ali, a renowned metalworker who was active under the reign of Nadir Shah Afshar (ruled 1736-1747). The other five pieces associated with Luft ‘Ali are in other prominent international collections including the Topkapi Saray Museum in Istanbul, the Victoria and Albert Museum and Wallace Collection in London, and the Museo Poldi-Pezzoli in Milan.